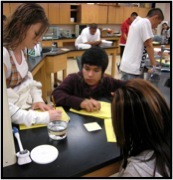 A project that originated in Dodge City is exploring the impact a curriculum steeped in inquiry-based laboratories and activities can have on student learning and attitudes. The project was formally commissioned a year ago to re-develop a curriculum to be delivered to general biology students in the 10th grade. With an honors program in place, the curriculum was designed for use by students in the lower two-thirds of the class. 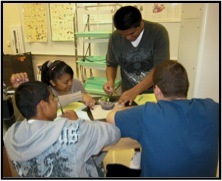 In the fall of 2009, two teachers (a co-author of the program, Shannon, and a teacher unfamiliar with the project, Kevin) used the materials in two pilot classes. The classes that would implement the curriculum were chosen at random from the catalogue. Numerical data was gathered from Kevin and compared to other sections of general biology that he taught using traditional materials (the lessons he had used the previous year, largely unchanged). Subjective data regarding student opinion was gathered from Shannon’s classroom in the form of written feedback and a video interview. In addition, both teachers have provided anecdotal feedback and both classes participated in an interview with the building principle during the school year. 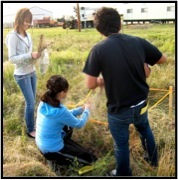 The classroom methods implemented included inquiry laboratory experiences, hands-on activities, a technology rich environment, and contemporary approach to note taking. 53% of all class days include laboratory work. When hands-on activities are added to the figure and assessments, assessment reviews, and a lab safety day are removed the “active learning day” percentage jumps to 81%. To supplement the classroom environment, the students had daily access to netbooks (very small laptops). They used the computers to access the class website for notes, handouts, or assignment turn-in. They also used the Internet as a resource for projects, the classroom forum for class discussions, and to interact with computer models and simulations. Finally, the class did not use a formal textbook. Instead, the students are trained to take effective notes (and use them). Lectures with note taking are limited to 20 minutes maximums, and PowerPoint slide counts to eight or less. The slides present the important information as it should be recorded, and nothing more. Students are allowed to listen to the lecture, because the noteworthy pieces have already been extracted for them. Afterwards, the product they have is useful to them during labs and activities. Results from the initial semester are promising. One section of Kevin’s class used the new materials and was compared to two of his sections using traditional materials. 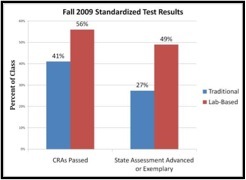 The standardized test scores showed significant change. On the district specific CRAs (criterion reference assessments), students that pass rose from an average of 41% of the class to 56%. This is a move of two and a half standard deviations. On the state assessments, the percentage of the class that achieves an advanced or exemplary score increased from 27% to 49%. Both control classes had percentages of 27% and 28%. While the sample size is unfortunately small, these results are at the very least promising. The numbers are compared in the graph below. 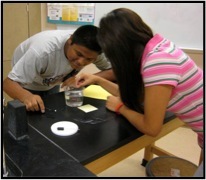 The early results indicate that all kinds of students can flourish in an inquiry environment. 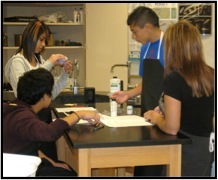 Many students in these classes are students that a teacher may consider unable to handle an inquiry-heavy environment. One student had already accumulated over 50 discipline referrals in his young career! However, there were zero behavior problems in either class all semester. The students indeed surpassed everyone’s expectations in almost every way possible. 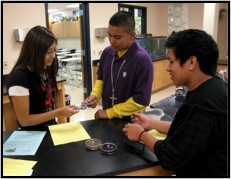 This study is ongoing, but the early data indicates science educators may want to rethink who can or cannot benefit from an inquiry-rich environment. For a more complete description of the semester’s results, including the students’ interview and all written feedback forms, visit www.biologyrocks.org. Kevin is using the inquiry-based materials in all of his courses this semester, and Shannon is using them in her honors courses. As the results from this semester become available, they will be posted to the project website as well. Next semester, a third cooperating teacher will begin using the materials in the same building. The project would also like to work with a beta site for replication. If you would like more information on the program, materials, or are interested in working with the project, visit the website or email mralph03@gmail.com.